Good Morning America (GMA) has been a weekday staple of the ABC lineup since 1975 for a total of 36 seasons and expanded to a weekend edition in 2004. Currently, the show is shown live on the east coast daily from 7am-9am and on tape delay in other time zones. GMA serves as a one-stop shop for all the day's news, weather, sports and other updates. They also provide breaking news throughout the morning with both in-studio and field reporting that typically features an anchor near an important event, court case or other current event. They also feature frequent profiles of celebrities and everyday people doing extraordinary things while also giving exposure to some of the hot topics of the day. Their weather forecast consists of a national spotlight by a meteorologist followed by local coverage by an affiliate ABC station. This takes place at least once an hour and sometimes more frequently depending on the time of year and other factors including snow and rain. Robin Roberts, George Stephanopoulos, Josh Elliott, Sam Champion, and Lara Spencer. Together, they bring a unique brand of news covering all areas of the country with their own personal flare. 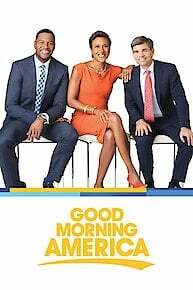 Good Morning America has consistently been near the top of the morning ratings for its category and has won three Daytime Emmy Awards (2007-2009). Michael Avenatti arrested, charged with extortion; 74-year-old woman wins child support for her 52-year-old daughter; Cast of 'Dear Evan Hansen' performs 'You Will Be Found' live on 'GMA'. Trump attacks McCain at event packed with veterans; 'Queer Eye' stars' incredible surprise reunion with fan favorite Mama Tammye. Nicolas Maduro accuses US of fabricating a crisis; Cohen to testify before 3 Congressional committees; WWE wrestler Roman Reigns opens up about his leukemia battle. The best fashion moments from the 2019 Oscars red carpet; Lady Gaga on her buzzed-about Oscars performance; Backstage with Oscar winners Regina King, Rami Malek and more. How to Throw the Ultimate Oscars Watch Party; Rare snow falls in California ahead of Oscars; What's on Wolfgang Puck's menu for the Oscars afterparty? American woman claims she was brainwashed by ISIS; Mom speaks out about son's Pledge of Allegiance arrest; Meghan Markle makes secret trip to New York City. Sen. Amy Klobuchar Opens Up About Her 2020 Campaign; Lena Headey talks the upcoming final season of 'Game of Thrones'; Grammy Awards shine spotlight on powerful, prominent females. 2019 Oscar Nominations: 'Roma,' 'The Favourite' lead, 'Black Panther' Scores Big; Trump says students in viral confrontation 'were treated unfairly'; The biggest moments from last night's 'Bachelor' episode. Sen. Kamala Harris announces 2020 presidential run; New fallout after viral confrontation between high schoolers, Native Americans; Children give speeches inspired by Martin Luther King Jr.
Flynn Sentencing Delayed After Attack From Federal Judge; Tributes pour in for Penny Marshall; Military sergeant surprises his family for the holidays live on 'GMA'. Who Will Be New Chief Of Staff As Trump Says Kelly Is Out? ; Massive winter storm blasts Southeast; How to create the ultimate DIY Christmas decor on a budget. New details on last hours of former President George H.W. Bush; Trump to attend George H.W. Bush's funeral; All the details from Priyanka Chopra and Nick Jonas' wedding. Special Counsel Says Paul Manafort Broke Cooperation Deal; Cyber Monday smashes sales records; Could this be the craziest Christmas lights display in America? Bobby Bones Credits His Work Ethic for 'DWTS' Win; Ivanka Trump allegedly sent White House emails from personal account: Report; Best apps to score deals for Black Friday. Record-breaking Thanksgiving travel in over a decade; Rick Scott wins Florida Senate seat, Abrams concedes in Georgia; Men from deadly Costa Rica rafting disaster speak out. Eyewitnesses Describe Bar Shooting That Killed 12; How to fight off the 'winter blues'; Chef Michael Symon shares 3 twists on Thanksgiving turkey recipes. Stacey Abrams Responds to Hacking Claims, Trump's Attacks; Man describes how he stopped shooter in Florida yoga studio; What happens when a group of teen girls goes on a 2-week social media detox. Trump Rallies in Red States, Where His Approval Ratings Are High; Man who stopped a gunman in a yoga studio hailed as a hero; Ariana Grande released a new song titled "Thank U, Next"
'GMA' Anchors Celebrate Halloween with 80s TV-Themed Costumes; Stars of beloved 80s TV shows face-off in the 'Witchy Witchy Which Show'; Last-minute DIY Halloween costumes you can put together in a flash. Police Investigate Anti-semitic Posts By Alleged Synagogue Shooter; Red Sox win 4th World Series in 15 seasons; Haunt your house with DIY Halloween tricks. Turkish President Lays Out What Happened to Washington Post Columnist; Rafting company's offices raided after deadly Costa Rica accident; Woman reveals she is a perfect match, will donate kidney to her neighbor. Trump calls for 'severe punishment' if Jamal Khashoggi was killed; Survivors help others as they wait for assistance; What is it like to be on board the world's longest flight? New Images Show Enormous Damage from Hurricane Michael; Real-life 'Hidden Figure' passes away at 83; Tennessee falafel shop named Reader's Digest 'Nicest Place in America'. Melania Trump Weighs In on the #MeToo Movement; What to know about rare disease causing partial paralysis in children; Inside Taylor Swift's record-breaking night at the AMAs. Full Senate vote on Supreme Court nominee delayed; Hundreds dead in Indonesia from powerful tsunami; Paula Faris' final day on 'Weekend GMA' and a look back at her best moments. Kavanaugh, Ford testify at historic, high-stakes hearing; New Lady Gaga song released from 'A Star Is Born' soundtrack; Happy National Coffee Day! How to spice up your morning cup. Avenatti on 3rd Woman's Accusations Against Kavanaugh; 911 calls released from day of 6-year-old boy's disappearance; Taylor Swift to star in upcoming Cats movie adaptation. Michael Cohen interviewed multiple times by Mueller's team; We had Adam Rippon interview Cate Blanchett and the results are magical. Kavanaugh, accuser called to testify at public hearing; Chen to leave 'The Talk' amid husband's scandal: Report; 'Mrs. Maisel,' 'Game of Thrones' win big at Emmy's. Mass evacuations as Category 4 Hurricane Florence approaches; Trump faces backlash for comments on Hurricane Florence prep; 'Dancing With the Stars' season 27 cast revealed: DeMarcus Ware, Tinashe and more. Remembering the life and legacy of Burt Reynolds; Hurricane Florence could take aim at East Coast; All the school projects funded by 'GMA' viewers and DonorsChoose. Trump Breaks his Silence on John McCain; New details on suspect, victims in deadly esports shooting; Luke Bryan, Sugarland, Dan + Shay reveal 2018 CMA Awards nominees. New Details on Deadly Shooting at Esports Tournament; Tributes pour in after Sen. John McCain's death; Patti LaBelle on Aretha Franklin: 'She was like my hero'. Harvey Weinstein accuser faces her own sexual assault allegations; Former Miss America slams pageant, calls for Gretchen Carlson to step down; How to wear some of this fall's hottest fashion trends. Victims Speak Out in US Catholic Sexual Abuse Scandal; 6-year-old orders hundreds of dollars of toys on Amazon ; Emma Stone gets personal in interview with Jennifer Lawrence. Charlottesville Prepares for Anniversary of Deadly Protests; 'I'm a clean ... white girl,' DUI suspect tells cops; James Bond producers say Idris Elba could be the next 007. Boyfriend of missing Iowa student speaks out; Trump mocks criticism of his meeting with Putin; Kelsea Ballerini on hosting CMA Music Fest with Thomas Rhett. Father of Missing Iowa College Student Speaks Out; Homeless man receives hundreds of job interviews after tweet; 'Mission Impossible' co-star says he was held at gunpoint in his own home. 38,000 evacuated as Carr fire continues to burn; Star Wars cast to include a posthumous performance by Carrie Fisher; Nick Jonas and Priyanka Chopra engaged? Expectations for Trump's high-stakes meeting with Putin; Woman found alive 7 days after her car plunged off cliff; Jennifer Garner talks about a possible 'Alias' reboot. Tensions high for Trump at NATO summit; Whitney Houston's mother responds to abuse allegations. 28-year-old Democrat upsets powerful congressman; Police investigate body found inside NFL star's home; Michael Douglas opens up about 'Ant-Man and the Wasp'. Trump takes hardline stance on immigration as reunifications remain a question; Roseanne Barr's emotional first interview since she was fired for racist remarks; Robin Roberts goes behind the scenes of 'Luke Cage'. Officers injured in shooting after confronting suspect; Trump takes on immigration at campaign-style rally; Who will be crowned this year's ugliest dog? How Will Trump's Order Affect Separated Children? ; Protests erupt after the fatal police shooting of unarmed teen; Fran Drescher dishes on 'Hotel Transylvania 3'. Trump Has Power to Pardon Himself: Giuliani; Women with the most common kind of breast cancer can skip chemotherapy: Study; Julianna Margulies' parenting advice to George Clooney. Manhunt for 2nd Person of Interest in Deputy's Death; Trump to meet with families of school shooting victims; Danish actress Brigitte Nielsen announces she's pregnant at 54. 2 cops among 3 dead in Belgium shooting; Starbucks stores closed nationwide for racial-bias training; Hero teacher who disarmed school shooter speaks out. New Details Emerge On How The Texas School Shooting Was Carried Out; Italian actress Asia Argento slams Harvey Weinstein at the Cannes film festival; Time magazine calls Harry and Meghan "modern royals"
John McCain Reads Passionate Excerpt from Memoir; Meghan Markle's half-brother pens open letter to Harry; Ron Howard celebrates 'Star Wars Day' on 'GMA'. Giuliani Says Trump Reimbursed Cohen $130K; Redskins cheerleaders allege sexual harassment in New York Times report; Carol Burnett dishes on 'A Little Help,' answers questions from young fans. Ashley Judd Explains Why She's Suing Weinstein; New details on Mueller's questions for Trump; Should doctors question adolescents about social media use? Caravan of Migrants Reaches US border; Bill Cosby trial juror speaks out after verdict; Renowned breast cancer surgeon Dr. Kristi Funk opens up about her new book. US Military Awaits Trump's Decision on Syria Missile Strikes; Woman adopts baby from pregnant mother she met on a plane; Martha Stewart demos how to make the perfect party centerpieces. White House Says Trump Has Power to Fire Mueller; Ex-'Silicon Valley' star accused of false bomb threat; Kerry Washington dishes on the 'Scandal' finale. FBI Raids Home, Offices of Trump's Personal Attorney; Zuckerberg calls Facebook scandal 'my mistake'; Doctor shares 20 foods you should be eating. Trump Appoints White House Physician to Cabinet; Judge drops most serious charges in fatal fraternity hazing case; 'Roseanne' thrusts parenting and gender identity into the spotlight. Stormy Daniels breaks silence on alleged Trump affair; Will March for Our Lives get Congress to act on gun control? ; 'Roseanne' cast opens up about the new season on 'GMA'. Parts of East Coast buried in snow and ice; New details emerge about Austin bombing suspect; Craig David performs 'Magic' live. New explosion in Austin injures 2: Police; Woman in so-called 'Gone Girl' case recounts the 'nightmare'; Wendy Williams opens up about her return to TV. Austin officials warn of suspicious boxes after explosions; Erin Andrews speaks out to raise awareness about cervical cancer; The best moments from last night's 'American Idol'. Trump Accepts Invitation to Meet with North Korean Dictator; Twins find out they were separated as infants, observed in childhood as part of study; Sting and Shaggy perform 'Don't Make Me Wait' live on 'GMA'. Democrats, women see new opportunities in Texas; Man arrested for stealing Oscar winner's statue; 'Bachelor' star changes his mind after proposal. 'Shape of Water' wins big at 2018 Oscars; How the Oscars addressed #MeToo and Time's Up; Jussie Smollett performs 'Hurt People' live on 'GMA'. School deputy 'never went in' amid shooting; Brendan Fraser says #MeToo; Ballroom champ who gave up dancing due to scoliosis dances again after surgery. Young woman claims she reported school shooter for stalking; What to know about SCAD-induced heart attacks; Meet Ginger Zee's new baby. 17 Dead In 'Horrific' High School Shooting; 'Veep' star Julia Louis-Dreyfus 'ready to rock' post-surgery; US skier wins Olympic gold in Pyeongchang. Top female Olympians pledge brains to concussion research; Reese Witherspoon discusses how an abusive relationship changed her. Rose McGowan speaks out on alleged sexual misconduct by Harvey Weinstein; Classified GOP memo alleging FBI wrongdoing sent to Trump; Tom Brady speaks out about radio host who criticized daughter. How a Government Shutdown Could Affect Americans; New study sheds light on possible threat of head injuries for youth athletes; Kristen Bell excited to be the 1st SAG Awards host: "I won't be compared to anyone else"
Alabama beats Georgia in overtime for national title; Tonya Harding says she was afraid after 1994 attack; Taraji P. Henson says she is "really proud" of upcoming film "Proud Mary"
'Me Too' movement takes center stage at Golden Globes; Behind the scenes at the College National Football Championship; Jennifer Lopez and Alex Rodriguez bring hope and relief to storm-ravaged Puerto Rico. Trump Attorney Sends Steve Bannon Cease-And-Desist Letter; Mechanic's tips to keep your car safe in the cold; 3 women share how they each lost over 100 pounds. Sunday's concert will also air on the Freeform network. A homeless man is under arrest after showing up to "Good Morning America" filming with the intent of stabbing Michael Strahan. Good Morning America is currently available to watch and stream on ABC. You can also buy, rent Good Morning America on demand at Hulu online.